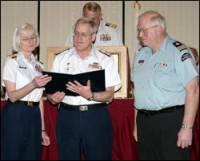 Two members of the ISAR 2002 Organizing Committee were honored during the USCG Auxiliary NTrain meeting in St. Louis on January 25, 2003. Commodore Robert C. Colby was presented with the USCG Auxiliary Commendation Award for outstanding achievement and dedicated service while serving as the On Water Competition Chairman for ISAR 2002. Mark Simoni was presented with the USCG Auxiliary Achievement Award for dedication, skill, and performance while serving as Deputy Chairman for On Water Events.